WHAT HAPPENED: The new Louis Armstrong Stadium didn't need to wait long for the first surprise in its history. A year removed from her sixth career appearance in a Grand Slam quarterfinal, former world No. 15 Kaia Kanepi nonetheless sent shockwaves through the women's draw on the first day of the US Open, as she knocked out world No. 1 Simona Halep, 6-2, 6-4, in the opening round. The current No. 44 blasted 26 winners to Halep's nine over the course of the upset and broke serve five times for her second career win over a reigning world No. 1 in one hour, 16 minutes. "She has been playing really well in US lately, so I thought I just have to be aggressive and try to stay calm. That's what I should do," Kanepi said after the match. "I remembered how I played her last time [in a three-setter four years ago]. I was just trying to do the same." The Estonian got off to a quick start in the match, as she won five of the first six games of the first-ever main-draw match played on the second-largest court at the USTA Billie Jean King National Tennis Center. Kanepi's serve was firing from the start, as she did not face a break point in the opening set and later served out a one-set lead emphatically to love. The Estonian doubled Halep's winner total in the first set – 13 to 6 – and also dropped just five points on serve overall. Her sizzling form continued into the second set, as she broke to open with a forehand return winner and won the first three games en route to securing a double-break advantage. Halep started to fight back from there, however, as she scored her first break of serve in the match in the fourth game of the second set, and later broke to love in the eighth game to level the action at 4-4. However, Kanepi held off the world No. 1's late charge and broke from a 40-15 deficit for the final time before sealing the upset, as a final Halep forehand sailed long. 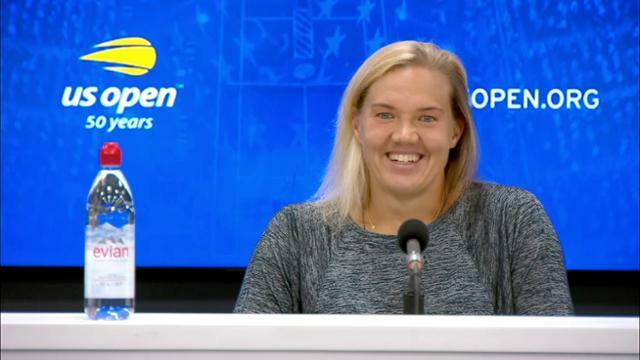 "I can be aggressive when I want to, because she defends a lot, but I have time to be aggressive," Kanepi assessed. "I think I didn't go that much anymore for my shots [at the end], and that's why it came to 4-4. I thought I have to hit more aggressive again, and I tried to do that." WHAT IT MEANS: With the loss, Halep made the kind of history she wouldn't have wanted when she arrived in Flushing Meadows. No WTA world No. 1 had ever lost in the first round of the US Open in the Open era, though it had happened five times previously at the three other Grand Slams combined. It is also the second straight first-round exit at the US Open for Halep, as she was defeated by Maria Sharapova in last year's opening round. "Today I just lost. I didn't play great, but she played really well. I knew that she can play well here. She played quarterfinals last year," Halep said. "I didn't find the balance today. I couldn't play better, so that's it. She started pretty well and pretty strong, so those first games were tough. Actually, I expected her to play like that without fear and hitting the balls really strong. I cannot say much about this match, just that I didn't really feel the ball. But also, she played really strong and pushed me back, so it was tough." The Estonian missed over a year on tour due to various injuries and illnesses prior to last year's US Open. In just her fifth tournament back last season, she came out of qualifying and won four matches en route to the last eight at the 2017 US Open before losing to eventual finalist Madison Keys. "I felt more pressure, because I have to defend my points, so I didn't feel really confident coming here playing the [No. 1 seed]," Kanepi said after the match. "I love playing here in New York. I have always loved it, so maybe the court also suits my game. I like the city. I like the atmosphere in tournaments and in the city, and I like the weather, humid and hot." MATCH POINT: Kanepi last defeated a world No. 1 seven years ago, when she upset Caroline Wozniacki at the WTA event in Tokyo in 2011. In defeat, Halep was complimentary of the Estonian's chances moving forward: "She's a very strong player, so she can -- she has a big chance to do a great result. It's second time when I played against her and always I felt that she has a very powerful game, so I knew about this. "I think she has the good game to go forward in this tournament." August 27, 2018 - Kaia Kanepi in action against Simona Halep during the 2018 US Open. August 27, 2018 - Simona Halep in action against Kaia Kanepi during the 2018 US Open. September 4, 2017 - Kaia Kanepi in action against Daria Kasatkina at the 2017 US Open. August 27, 2018 - Kaia Kanepi shakes hands with Simona Halep after winning her match at the 2018 US Open. August 27, 2018 - Kaia Kanepi reacts to beating Simona Halep at the 2018 US Open.